Damage/Repair Old arrested bug damage, a few cracks. Indigenous repair with nails. Additional information: A stool with a large platform and heads protruding from each side. 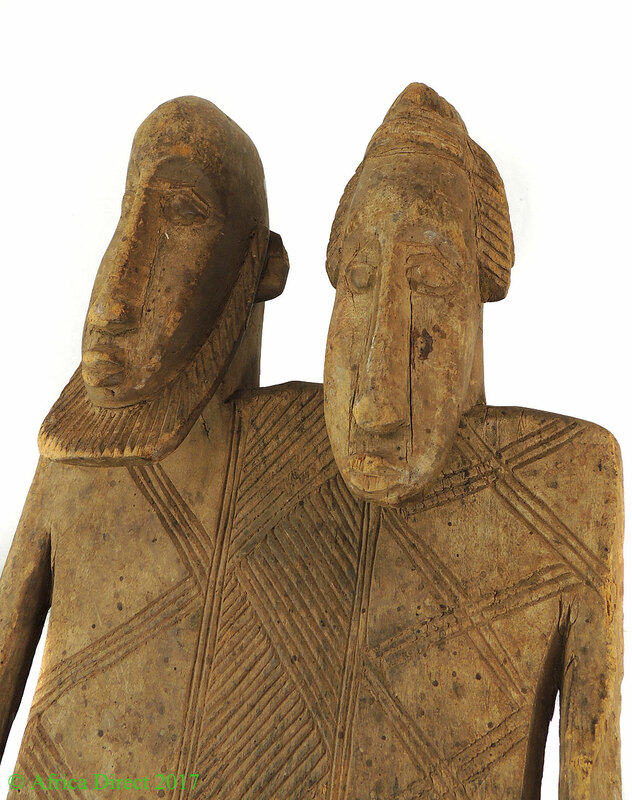 Further inspecition reveals the faces are those of the famous Dogon primordial couple. The headrest is decroated with angular motifs and hte base is supported by 6 caryatid figures. Dogon art is not a single fixed style as has been often characterized in discussions of their sculpture, for the age of Dogon art extends to the past as early as the 12th century and continues to be created in the present with a number of sub-styles measured against the core of an identifiable Dogon art and style.The Dogon interchange stylistic elements with neighboring groups producing an interesting hybridism in some of their interesting sub-styles. 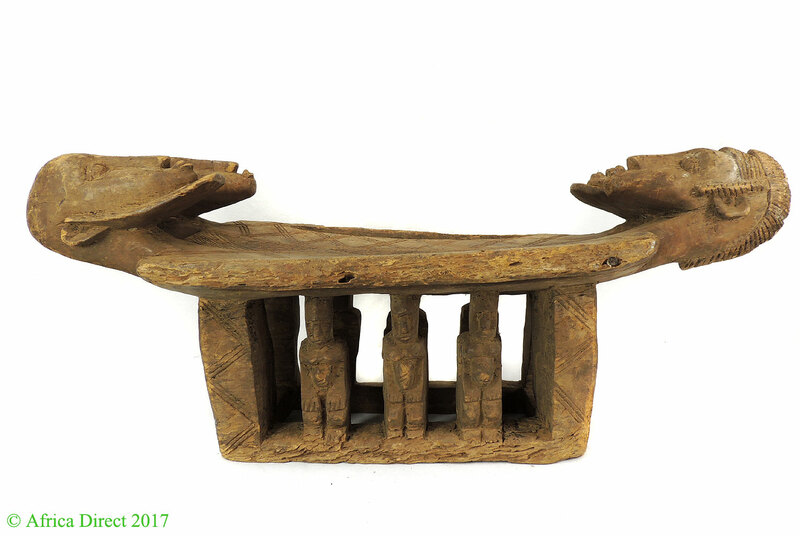 This headrest/stool may reflects an influence that neighboring groups can have on the well defined core of Dogon sculpture. 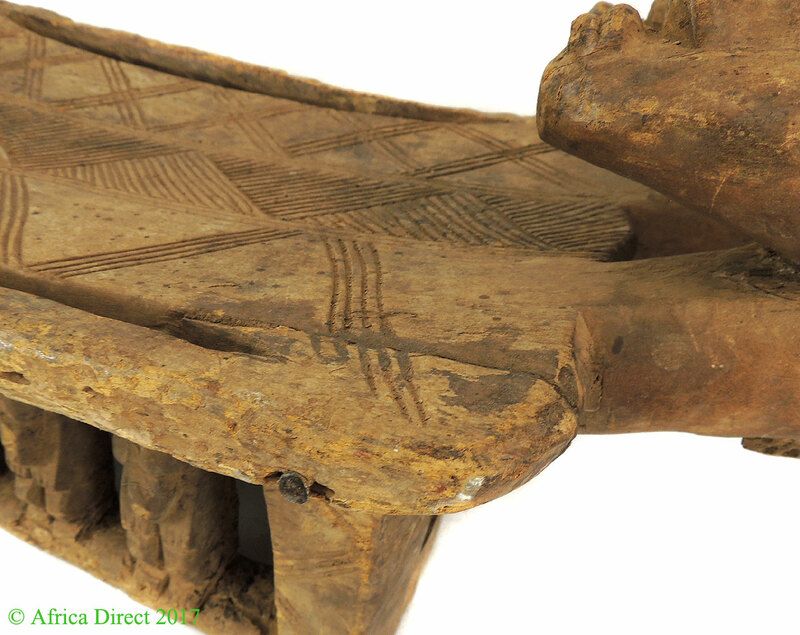 Scholars do not have enough evidences to confirm if the Dogon have produced and used headrests. 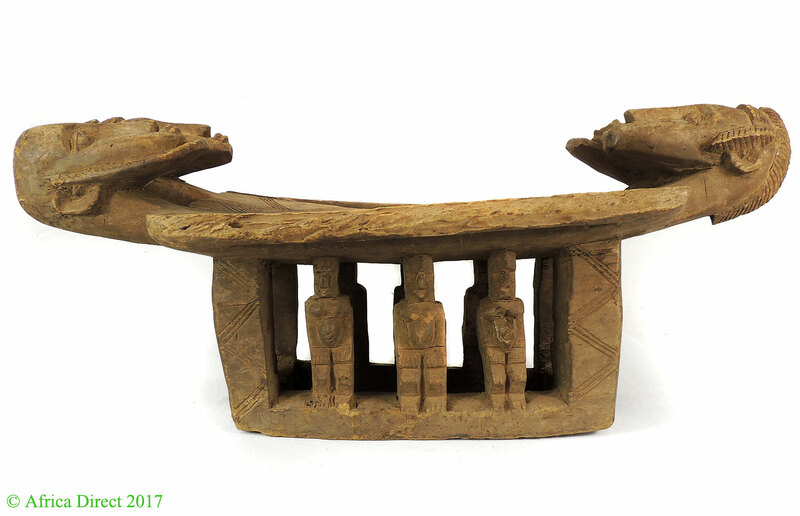 Number of them state that most of the headrests attributed to the Dogon were carved by the Tellem, an old population who first occupied the Dogon region. 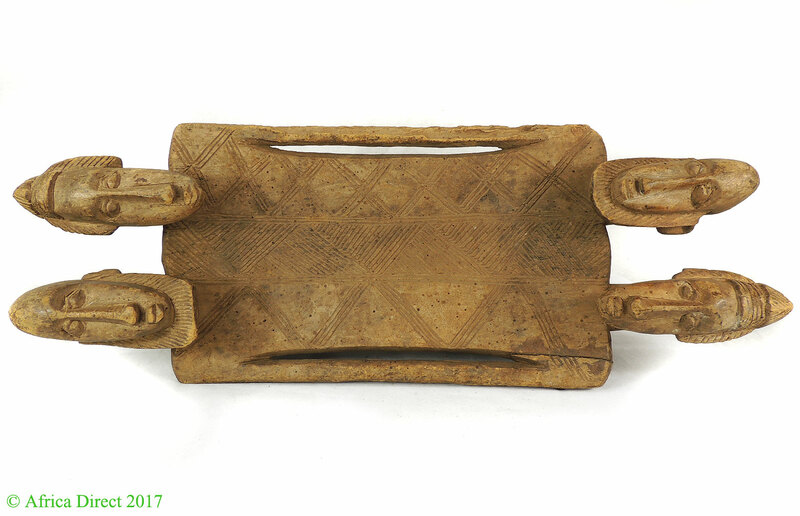 A few scholars support that headrests were carved and used by the Dogon, especially by Hogon priests and during burial ceremonies. 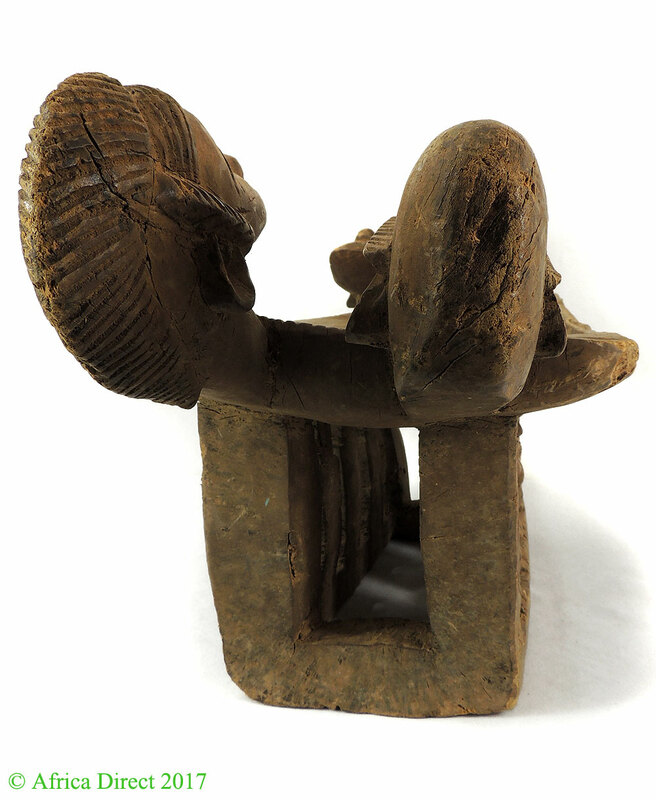 The head on this headrest/stool is similar to these found on Dogon artifacts. 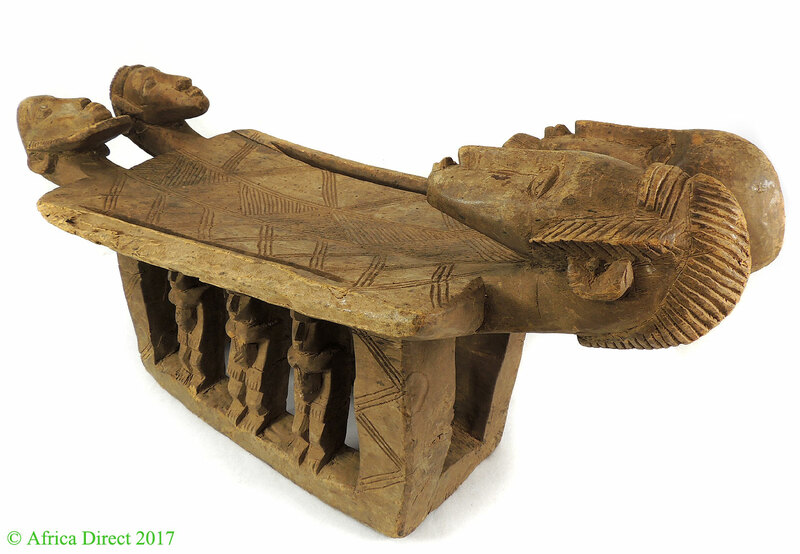 Recommended Reading: Laude's AFRICAN ART OF THE DOGON, Amex DOGON STATUARY, Ezra's ART OF THE DOGON, Ndlaye's ARTS DU PAYS DOGON.